Our family went to a different "mill" with the Sisson family for the first time last week...and we were on our own for most of the time! We were pretty nervous about it, but many cars stopped and took our information. 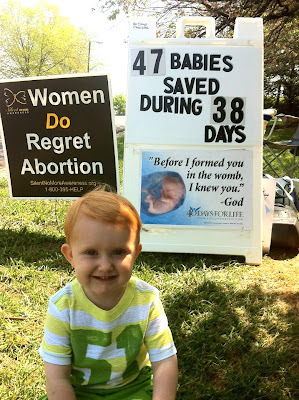 And we know of one definite baby and mother who were saved from the devastating effects of abortion that day! Another interesting side note: This new clinic is on a very busy street, so we were surprised by all the friendly honks and thumbs up we got (with just a couple minor negative people.) We only had one sign which reads "My Life is a Gift". This week we will add two more signs: "My Life has a Plan" and "My Life has a Purpose". The children hold these up and it's very sweet--I will take pictures this week. We will also begin speaking on a microphone so our voices can carry into the waiting room for the women to hear. Please pray for our protection as we are constantly under camera surveillance and there are also secret microphones (not to mention the busy street)! 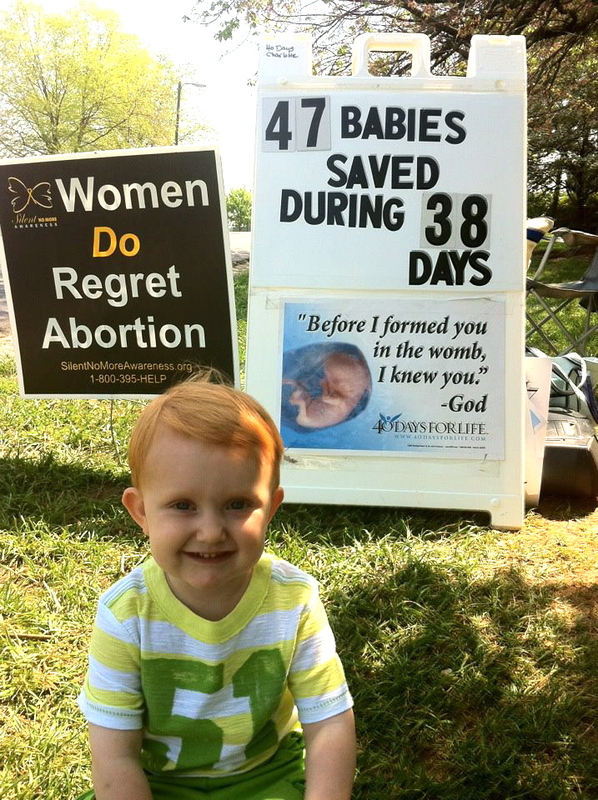 Little baby H., saved from abortion! My name is Juanita*, I am 34 years old and I now have 3 beautiful kids, and a wonderful husband. I want to tell you my story of how I came to know Jeannette Wilson, a sidewalk counselor, and Sheryl Chandler, from Truth & Mercy Pro-life Ministry. About 14 months ago [in September of 2010], I separated from the father of my [now 7-month old] baby, H. A week later I found out I was pregnant with my third child. I had a job but I had just purchased a house and had many bills because of the separation. I thought the best thing to do was to have an abortion. Mostly, I think my mind was going crazy; I was depressed. It sounds bad, but that’s how I was feeling and I didn’t want to have to see my baby’s father again. I asked myself, “What will people say about me? I have 3 kids and I’m a single mom.” I remember I cried every single day, thinking about what I was going to do. Finally I decided to go ahead with the abortion. I went to the clinic and was thinking, “Just get it over with. Tomorrow, or next week, everything will be fine.” When I got there, I was nervous and I saw a group of people outside so I kept driving past the driveway entrance; but, at the next street I turned around and went back to the clinic. I heard everything the Christians outside were saying, but I told myself to just keep going and not to look at them. I parked, went inside the clinic, gave my driver’s license to the receptionist and waited. While sitting there, I kept hearing a woman’s voice on a speaker, coming from outside. This was Jeannette. She was saying that God loves me and that He has a better plan for me than abortion. I felt like crying, but I looked around the waiting room and all the other women in there were just talking and smiling as if nothing bad was being done at this clinic. Now that I think back, that place is like a slaughterhouse. They’re killing innocent little angels. How can people just sit there as if nothing is going on? While Jeannette was talking, I felt pain in my chest and sick to my stomach. I felt like crying. I stood up and went to the receptionist’s window and asked for my ID back. The lady there was rude and asked, “Why? You’re next. Give me your money and go on back.” I told her that I had changed my mind and I wanted my ID back. She just threw it at me and I left. As I started to leave the clinic, I saw Jeannette and her kids and I stopped to talk to her. She asked if I had the abortion and I said, “No.” She looked relieved. She talked to me about Jesus and how He died on the cross for me, for my sins, and that He wants to forgive me. He is a loving God. His power and grace is what made me change my mind that day. When Jeannette told me how He died for me and how He loved me and would care for me, this made me realize how wrong it was for me to destroy my baby’s life. She told me about Sheryl and Truth & Mercy and how she helps many women who chose life and how she could help me. We exchanged numbers and we kept in touch. In April, Sheryl and Jeannette came to my home, brought a vanload of baby gifts and took me to dinner. They talked to me about God, salvation, and His plans for me and for my baby. They told me that this baby is not a mistake and that God will use him for my good. This has already happened and I know it will continue. I received an enormous amount of baby gifts for little H., and my other kids, from all the wonderful people that support and help Truth & Mercy. It’s beautiful to see how all these people love and care for someone like me, who didn’t even care about anybody else. God has changed me and blessed me and my family. Since I had my baby in May, my life has changed a lot. We started going to church more often. I began a bible study with a nice lady from my church once a week. After the second week of study, I told her I wanted to receive Jesus in my life and in my heart. I wanted Him to take over my life and continue to make me grow spiritually. When little H. turned 2 months old, his father and I reconciled and got back together, I told him what I had planned to do after he left – the abortion – and he told me he was glad I didn’t do it because he loves H. so much. We got married on October 18, 2011. This is a blessing from God. He is giving me the family I always wanted. Another blessing we received from the Lord was through the contacts of Truth & Mercy. During the summer, our A/C and heating system broke down and we had nothing to keep the house cool, nor would we have heat in the following winter. It was a terribly hot summer. I contacted Sheryl and quickly we received 2 window A/C’s for the house from wonderful people who love to help. A month later, 3 wonderful people read Sheryl’s newsletter about our need. God touched their hearts and between them, and also Sheryl, they helped us get a brand new HVAC system in our house, at no charge. When Sheryl told me about this, I cried, prayed, and thanked the Lord for all these things and for the people who unconditionally give to others, not desiring to get anything in return. What was most beautiful to me was that the men who did the work and paid for the unit, didn’t want to receive any credit for this. They told me that God is the only One we should be grateful to. He has also blessed us by finding a job for my husband; he had been out of work for about 3 months. I am just sorry that I didn’t know Jesus until now. I didn’t know how wonderful He is! Before I met Jesus I felt empty inside, but since I accepted Him in my life, I feel complete. Now I have a wonderful family, a home, health, food, and best of all I have His unconditional love. It really is a miracle how my life has changed. 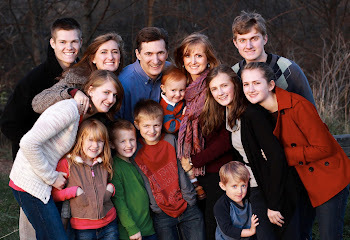 After getting pregnant, I met all these wonderful people, who are like angels that God sent for me. I remember at my baby shower, Jeannette and Sheryl told me that God had a purpose for little Henry and my family, and now I can see why. I want to thank the Lord for bringing together Christians who go to the abortion clinic to witness and pro-life ministries like Truth & Mercy. They help no matter what the situation is. There’s nothing impossible for the Lord. These women and unborn children need many more angels of mercy and you and your family will also be forever blessed by such efforts! *I changed her name for privacy.